Oh, that typical teenage Mum. Really? Why should all young Mums get grief off other Mums and other people? I fell pregnant at the of 16 and gave birth to my beautiful daughter 4 months after my 17th birthday. I'm not ashamed of it and never will be. She wasn't planned and things didn't go to plan afterwards either and I am still not ashamed of having my baby girl at a young age. There are many young mums who do decide to choose men, alcohol, going out and the 'free life' after having their baby's but a lot of people need to understand that not all young Mums are like that. I know a few 'older' Mums who are like that. My Mother decided to choose an abusive man over me and my brother. She has chosen drugs, men and other things over her kids. She is now in her 40's and I know a lot more Mums that age who are the same too. So why is it just the young ones who get the bad words and judgement? Having my first daughter 4 months after my 17th birthday didn't ruin my life. She didn't stop my life. I still managed to get pass my childcare course at college and I still managed to get a job when she was 5 months old. I don't have many friends but I rather a small group of trustworthy friends than a whole gang of friends. I don't get to go out often by myself but when I do, I sure do enjoy it! My baby hasn't stopped my life and she sure well hasn't ruined it either. My daughter gave me a whole new life to live. I wouldn't of had that nursery job, I wouldn't of met my current partner and that means I wouldn't of had my life that I have now. I do sit down and think sometimes, how would my life be if I didn't fall pregnant at such a young age and I just can not imagine it. I am not ashamed at letting people know that I fell pregnant at 16. Why should I be ashamed? Age is just a number. Although many times I have felt like a complete failure and the worst Mum, I wouldn't change my life for the world. 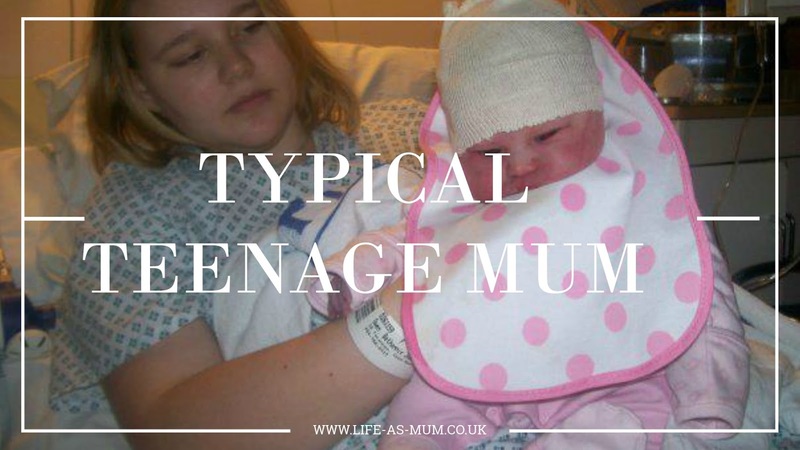 Have you ever judged a young Mum? If so, why? Great post, and very true. There would probably be a lot more teenage mums, but choices are made. I've never judged, just always thought how brave they are. Well done on getting your qualifications, childcare will come in Very useful. Childminders do very well in my area. At least you know you can always work with your child being around. It's the perfect choice. Great post. I think that good and bad mums come in all age groups and I've seen plenty of examples of all of these. You know you are doing a good job - my grandmother used to tell me that what other people think of you is really none of your business. Aw well said, I think you are an amazing mum and never let anyone make you feel not worthy because they are not worth a second of your time. My mother was a teenage mum and wasn't fit to be a mother but that has nothing to do with age, its more about her maturity and her lack of maternal nature. It's not just young mum's. It'sike everyone judges no matter what. I had my eldest at 30 and was told I was "too old" and "selfish". They even called me "geriactric" at the hospital! You can't win. Mums are judged in general. It could be that people think you are too old, too clingy, not interested in your kids, there is always something. Sounds as if you have proved them all wrong. That is all that matters. You should never be ashamed! You will be a great mum. Having a child is one of the biggest miracles imaginable, it's something to never be ashamed of. I respect your story and bravery. I'm sure you're a great Mum and shame is not something you should even think about. Your job is to look after your kids and you look like that's on track. I had my first son 3 weeks before I turned 23 and I love the fact that I had him at a young age, it means we get to spend more time together in life. You should be proud of yourself and ignore anyone who judges you. Looking after a child is the hardest job in the world, and I have the utmost respect for anyone who can stick at it - stereotypes be dammed. Hi Beth. I had my first child at just after my 20th birthday. I was judged so much but I wouldn't trade my daughter for anything she's 13 now and we have a great relationship.